With Spain backing off its excessively generous feed-in tariff (FiT) and Germany’s digression rate kicking in, the new frontier for growth in the European market could be Italy. Clearly financier CERTUS Life Cycle AG (CLC) of Germany thinks so. To go to work developing the Italian market, CLC did its due diligence and picked Canadian solar installation specialist Day4 Energy, a company with a proprietary panel installation technology and a chain of partners anxious to go to installing sun. No word yet on the first projects. The Campobello di Mazara Council of Trapani, Sicily, IS building a solar installation - on land it confiscated from a local mafia boss. The council will sell the power generated by the Sicilian sun to the Italian national gird and use the revenues to fund small and family enterprises and arts and crafts projects by victims of the Mafia and of workplace accidents. Footnote: Confiscated Cosa Nostra dons' trophy villas and hideaway farms across the Sicilain countryside now grow honest agriculatural produce. Youth coops in the rural crime triangle between the fiefs of Corleone, Monreale and San Giuseppe Jato make pasta, olive oil, wine and honey sold in Coop supermarkets all over Italy. One of the youth coops is named Placido Rizzotto - Libera Terra after a land reform campaigner murdered by the Mafia in 1948. 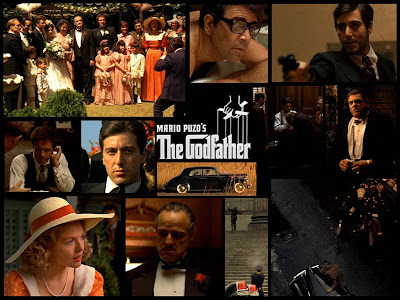 Corleone, the town in the hills near Palermo made famous in The Godfather, was where Cosa Nostra don Toto 'the Beast' Riina and his next-generation Mafiosi reigned in the '70s and '80s. Riina’s Corleone luxury apartments are now the headquarters of the local tax police. Day4 and CLC will partner to develop investor funded photovoltaic (PV) power projects in Europe, especially Italy. Trapani will build solar panels on land confiscated from Spezia. 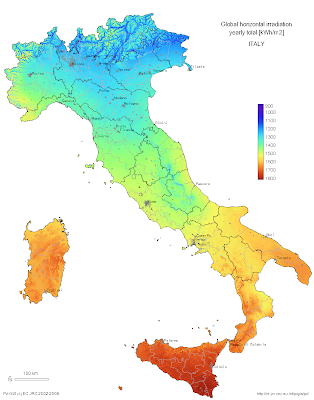 - Italy currently produces less than 5% of its electricity from New Energy sources. There is no report on when the Trapani installation will go online or when the CLC/Day4 Energy projects will begin but they indicate that Italy’s national grid soon be carrying a lot more solar energy-generated electricity. - The Campobello di Mazara Council solar project was announced August 27. - CLC is based in Freiburg, Germany. - Day4 is based near Vancouver, British Columbia, Canada. - Trapani, a small town in the west of Sicily. - CLC has specialized in insurance investments and recently moved into PV power projects. 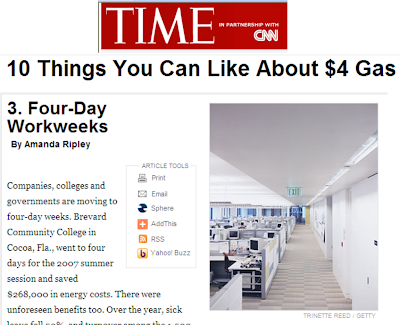 - Day4 will be responsible for modules and system integration; CLC will commission and fund the projects. - Day4 designs, manufactures and sells PV modules using its patented, proprietary Day4 Electrode technology, a method of connecting solar cells that produces high power density, increased lifetime, aesthetically appealing solar panels. - The Campobello di Mazara Council says its solar installation will cost 1.850 million euros, will be partially funded by the Italian interior ministry and the EU, will be made up of 1,320 panels and will generate 510,000 kilowatt-hours of electricity per year. - Italian authorities have made a point of using confiscated Mafia property for public institutions. - Bernd Sibold, CEO, CLC: "Having undergone a significant amount of due diligence we feel that Day4 Energy's ability to combine the installation expertise of its channel partners with superior field performance of Day4 Electrode modules creates a highly attractive investment proposition for our investors." - George Rubin, president, Day4 Energy: "I am excited about this strategic co-operation with CLC…to create numerous project opportunities for Day4 Energy and its channel partners…Solar energy is the business of pre-paid electrical power…financing is an integral part of the solution that also includes technology, system design and installation. We already have industry leading module technology and our channel partners are the best PV system experts in the field…"
To Joyce and his main character, there is a big, big universe beyond the little island of Ireland. But he and his island are at the center. 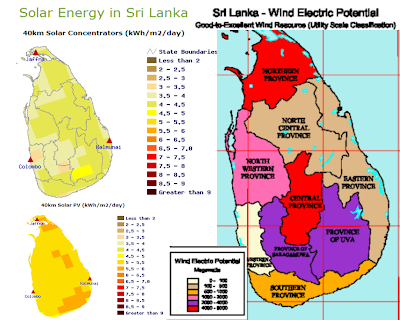 In A world without oil and coal: a solution for Sri Lanka’s electrical energy crisis in the post fossil fuel age, Asoka Abeygunawardana argues that Sri Lanka must resist the building of new coal plants because of the state of global climate change. Like James Joyce, Abeygunawardana sees his island homeland to be as much as any other place the center of the world - and, as so, at the center of the world's fight against global climate change. He takes his responsibility very seriously. Abeygunawardana presents 2 broad arguments for his position that Sri Lanka’s government must turn away from coal in its next 6-year energy plan. His first argument is cost. Fossil fuel reserves are peaking. New fossil fuel generation has already become expensive and, as supplies peak, the cost will be greater. Abeygunawardana’s second argument is about global climate change. Climate change is the result, more than any other single cause in human control, of greenhouse gases emitted from burning coal to generate electricity. Sri Lanka must, Abeygunawardana argues, do what it can to avert the natural disasters likely to result from unchecked climate change that are likely to cause massive loss of life and property. Sri Lanka's Environment Minister Champika Ranawaka, its Minister of Science and Technology Tissa Vitarana and the Vice Chancellor of Moratuwa University Vidyajothi Ray Wijewardane heard Abeygunawardana make his case at the launch of his book. The fight against coal in Sri Lanka today could be the fight against coal in India tomorrow and the fight against coal in China the next day. 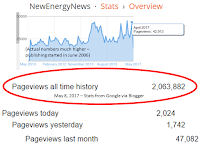 It is with deep gratitude that NewEnergyNews therefore acknowledges the contribution of a writer far from the grand rostrums of Brussels, Washington, D.C., or Denver’s mile-high Invesco Field who nevertheless is speaking truth to power. Speaking at the launch of his book August 27, Abeygunawardana called for a Sri Lankan 6-year energy plan that includes the development of New Energy. Sri Lanka is a small player in a big world. That big world is in crisis and the smallest actions could have big impacts. - Several of Sri Lanka’s concerned leaders (Environment Minister Champika Ranawaka, Minister of Science and Technology Tissa Vitarana and Vice Chancellor of Moratuwa University Vidyajothi Ray Wijewardane) heard Abeygunawardana make his case against coal and for New Energy. 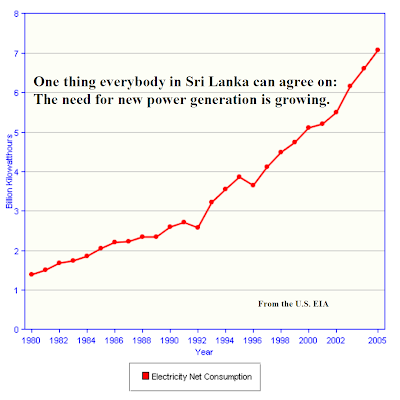 - Abeygunawardana contends that the CEB’s reliance on coal in its energy plan is based on the mistaken belief that coal is the cheapest source of new power generation. - Abeygunawardana’s calculations put the cost of new coal generation at 5 times the cost of the CEB’s calculation (Rs 30 per unit vs. Rs 6 per unit). 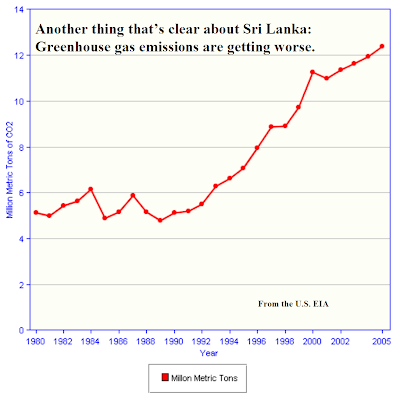 - Abeygunawardana presents 2 broad arguments for his position: (1) Peaking fossil fuel reserves and (2) the costs of global climate change havoc. A South Korean newpaper took a look at the new New Energy projects, many presented at the seventh International Sustainable Energy Symposium at Seoul’s Ritz-Carlton August 24. Profiled: A small artificial tree that generates electricity from the slightest breeze; Anaconda, a plastic wave energy concept; Floating deepwater wind turbines; Copper pipes laid into heat-absorbing asphalt to supply solar-heated hot water; multicolored thin films with increasing efficiency; deep geothermally generated steam. These are all exciting ideas. Some have real potential - it's just a little too soon to know which ones. A recent European Wind Energy Association (EWEA) study predicted most European wind will come from deepwater floating turbines in the 2030-2050 period. Experimental trials of deep geothermal and copper pipes in asphalt for hot water are ongoing. The other projects are in prototype stages. One of the best reasons to study New Energy: Possibilities beyond tomorrow. People building audaciously, hopefully. 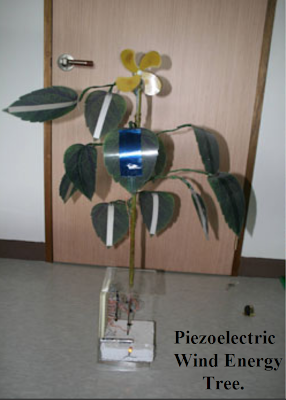 5 to 6 hours: A 3.3 mph wind blowing a 100-“leaf” electric tree could charge an AA battery. 2030-2050: Most European wind expected to come from deepwater floating turbines. 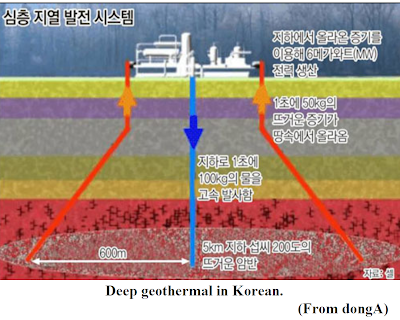 2050: A Korean expert says the U.S. will have enough deep geothermal to replace 100 nuclear power plants. - The Anaconda is being developed in the UK at the University of Southampton. - Blue H’s floating offshore wind installation will be 19 kilometers out to sea. - Worcester Polytechnic Institute is in Massachusetts. - France, Germany and Australia developing deep geothermal, drilling 3 to 5 kilometers down for the earth’s heat. - The wind energy tree is a meter (~3 feet) high. It is made of piezoelectric material, material that generates energy from movement. - Anaconda, now in small prototype but eventually to be 7 meters in diameter and 200 meters long, is a snake-like plastic, fluid-filled cylinder with sealed ends. It rides the ocean surface. With wave motion the fluid inside compresses, flows through and turns a turbine at the tube’s end. 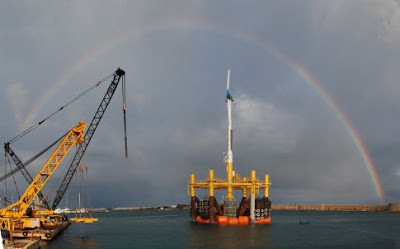 - The Blue H offshore installations are said to be able to utilize stronger, more consistent winds, cheaper to build and less intrusive to the ocean environment and shipping than near offshore installations anchored in the seabed. - The heat of solar energy can be absorbed by water in high thermal conductivity copper pipes in asphalt can be used as a solar hot water heater. - Research teams are varying the colors solar panels’ glass in pursuit of capturing a wider slice of sunlight’s spectrum and boosting thin film efficiencies. 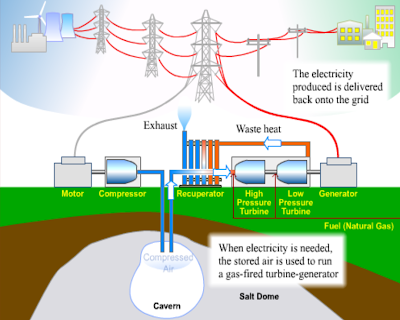 -Deep geothermal uses the 200 degree-Celsius deep earth hot rocks to boil water to drive turbines. Indulge in this little bit of soul from Sam Cooke: “It’s been a long time comin’ but a change is gonna come…Oh yes it will.” Watch out for the last image – it’ll getcha. From jenniipoochan/Sam Cooke via YouTube. The message is clear whether you speak Italian or not. From PaloccoKyoto via YouTube. A short (61-second), elegant exercise in music and image on behalf of wind energy. From emmanuelleantolin via YouTube. 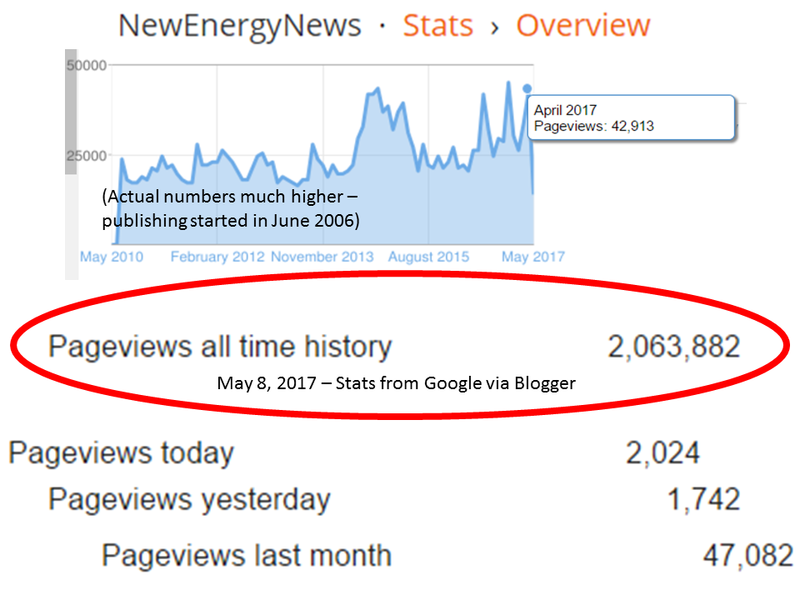 Finally, there is something good about the dark cloud of crash slowly moving over the bright growth of New Energy’s last 3 years. 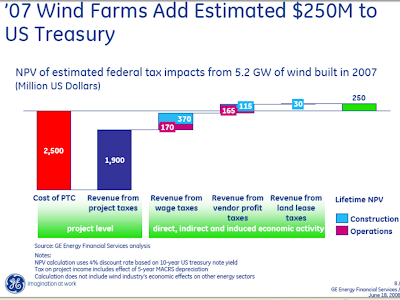 If conservative members in Congress hold true to their drill-or-nothing mentality and block extension of vital wind energy production tax credits (PTCs) and investment tax credits (ITCs), the booms in the solar and wind energy industries are likely to be dramatically truncated. The silver lining: This might give power grid regulators a chance to take action. In order to put New Energy to work to its fullest potential, the U.S. needs a $60 billion investment in new transmission infrastructure. 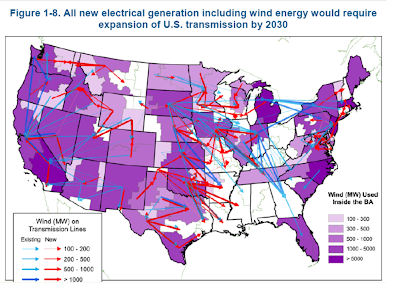 With the U.S. wind industry aiming to produce 20% of U.S. electricity by 2030 and the U.S. solar industry aiming for 10% of U.S. power by 2025, the nation is going to need something better. The U.S. grid: ~200,000 miles of wires with ~500 owners. Result: Upgrades involve multiple companies, multiple states, multiple permits and many backyards (as in Not-In-My-BackYard NIMBYs). Catch 22: National leaders are aware of the need for a new grid but must defer to states on the issue. State leaders have better things to do with their budget funds than build infrastructure to send power out-of-state. Within states, Competitive Renewable Energy Zones (CREZs) are making progress possible. Texas has been aggressive about building transmission to deliver its own wind power to its own cities. California is moving on transmission to get its own solar power to its cities. Yeah, well, good luck with getting Congress to take action on anything more controversial than lunch, Boone. One possible way out of the conundrum: Renewable Electricity Standards (RESs) are now mandated in over half the states. The laws require utilities to get a certain amount of power from New Energy sources onto the grid by a date certain. Such statutory parameters could force the states to act. Plans exist for adequate transmission. American Electric Power (AEP) drew up a transmission vision for a network of new 765-kV lines. (See BLACKOUT PLUS 5 YEARS: BETTER GRID, NEW VISION) The trick is getting the plans built. Many in the “know” are not optimistic. Perhaps a time-out on the building of new generating infrastructure will give everybody a chance to take a look at the situation, especially under the ambitious eye of a new administration and a new Congress. The good news: Boone Pickens says the entire cost can be covered by entrepreneurs if legislators can free them up to act. The bad news: Action will almost certainly require exercising the right of eminent domain. Does the need for a 21st century transmission infrastructure justify taking someone's private property? Does it justify taking YOUR private property? Solutions: (1) Build new transmission in existing corridors. (2) Bury the new transmission. (3) Pay justly for the rights-of-way needed, making those imposed upon partners instead of opponents. This CAN happen. It MUST happen. Building the New Energy infrastructure of the 21st century will require a $60 billion investment in new transmission infrastructure. - The U.S. grid was conceived at the beginning of the age of electricity, shortly after the beginning of the 20th century, to allow utilities to share their power supplies. - Old lines carry less power and lose more of the power they carry as they carry it. - Power generating capacity is growing 4 times faster than power carrying capacity. - New York state has essentially not built a new power line in 20 years. - Solar energy-generated electricity will need a better grid for 2 reasons: (1) solar power plants will be concentrated in the southwest and will need to deliver power to populations centers and (2) distributed rooftop generation needs special 2-way management. - Wind energy-generated electricity will need a better grid to deliver its power from the Midwestern plains, the Great Lakes region and offshore installations of the Mid-Atlantic Bight. - The $60 billion cost of new transmission can be spread over years and paid for by tens of millions of electricity consumers. - Ex of the problem: Maple Ridge Wind farm in upstate NY, $320 million, ~200 turbines, frequently even during times of good wind, cannot deliver its generation due to tie-ups on the grid. - Ex of the problem: Wyoming remains undeveloped due to the lack of transmission to deliver power to population centers in the sunbelt. - Ex of the problem: After the 2005 energy bill gave DOE the power to act but when it designated Mid-Atlantic and Southwestern regional transmission corridors, 14 Senators ojected. - Ex of the problem: States object because they fear the sale of their cheap power in other markets would drive their prices up. While the U.S. enwraps itself in the entertaining distractions of a presidential horse race and debates the irrelevant issue of pointless drilling for a useless amount of oil while continuing to consume an absurdly excessive proportion of the world’s dwindling reserves, the rest of the world grapples with the serious question of how to extend its noble if so far ineffective struggle against global climate change. From the courageous thinkers at the UN who are working against all the world’s forces of inertia and selfishness to make the Clean Development Mechanism (CDM) a workable part of the EU Emissions Trading Scheme (ETS) comes a bold new idea: A level playing field. Reforming Energy Subsidies; Opportunities to Contribute to the Climate Change Agenda is a new United Nations Environment Program (UNEP) report calling for the end of energy subsidies. This may come as a surprise to NewEnergyNews readers who so often see on this web page arguments on behalf of New Energy incentives like production tax credits (PTCs) and investment tax credits (ITCs). In a country that has long subsidized its fossil fuels industries, subsidies and incentives are the only way New Energy can get in the game. There IS a simpler way to go: End ALL subsidies. Let every energy compete on a level playing field. Make every energy pay for the costs it imposes on society and let consumers pick the winners. Now bear in mind, this means coal must pay for its greenhouse gas emissions (GhGs) and the cancers and lung diseases it causes and the environmental degradations it wreaks. Nuclear must pay for its own insurance and it must pay the costs of the waste it generates without a safe place for storage or disposal. Oil and gas can no longer have its golden gimmick, protecting it from U.S. taxes. And it can no longer have its depletion allowance, an "inventory" deduction the U.S. tax code granted the oil and gas industry for selling off its customers' supplies of oil and gas. The solar and wind and wave energy industries need tax credits but have need to deduct for the sun and wind they consume, as the next day sees a completely replenished "inventory." When Old Energy gives up its subsidies, New Energy will not need tax credits. New wind is now the economically preferred source of new power generation in the U.S. and solar power plants are approaching grid parity. The new UNEP report came in response to concerns with how EU subsidies for ethanol and other AGROfuels have had serious unintended consequences. The report’s 4 Key Messages: (1) Subsidies often cause increased consumption and waste of energy, worsening environmental harms. (2) Subsidies burden government finances, weakening economic growth and impeding investment in social equity. (3) Subsidies undermine private and public investment in the energy sector, slowing the expansion of distribution networks and the development of New Energy technologies and distributed generation. (4) Despite intent, subsidies often fail to help the needy and often benefit the affluent. Achim Steiner, UNEP director and U.N. undersecretary general: "In the final analysis, many fossil fuel subsidies are introduced for political reasons but are simply propping up and perpetuating inefficiencies in the global economy…"
Reforming Energy Subsidies; Opportunities to Contribute to the Climate Change Agenda is a new report from the UNEP calling for the phase-out of all subsidies to Old Energy or, at least, significant reforms in existing subsidies. - Last year: Riots in Myanmar when authorities short of funds raised fuel prices 500%. - Last few months: India, China, and Indonesia were forced to cut fuel subsidies due to rising oil prices. - The report was presented at 2008’s 3rd UN conference to work out details of the Kyoto Protocols’ next phase, beginning in 2013. - Top 10 fossil fuel-subsidizing nations: Russia, Iran, China, Saudi Arabia, India, Indonesia, Ukraine, Egypt, Venezuela, Kazahkstan. - The Indonesian government’s direct spending on petroleum products and electricity is close to one-quarter of its budget, 5% of the country’s GDP, and it has led to acute pressure on the government budget. - Cuba subsidised oil and ended up rationing it. - Iran, a major oil exporter, had to import 40% of its gasoline in 2006 to meet demand for subsidised fuel. - The conference at which the UNEP report was presented was in Accra, Ghana. (4) Practical; (5) Transparent; (6) Limited in time. - Justifications for subsidies: (1) To protect a domestic industry and promote jobs, (2) to stimulate economic development for national and social unity, (3) to cut import dependence and build energy-security, (4) to make energy more affordable and raise living standards, and (5) to protect the environment. - Governments spend as much as $300 billion a year total in subsidies that encourage consumption and discourage efficiency. 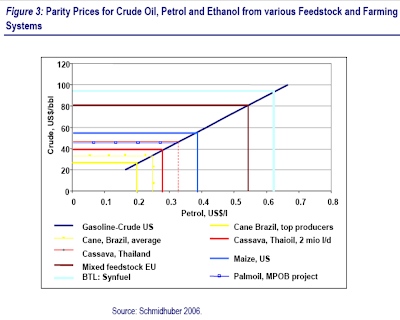 - Losses of efficicency due to subsidies: (1) Lower energy prices lead to more energy consumption and discourage conservation. (2) Lower prices create lower returns to suppliers and discourage improvements to infrastructure, resulting in old, dirty technology. (3) Subsidies drain government finances. (3) Caps below “market-clearing levels” may lead to shortages and costly rationing. (4) Consumption subsidies boost import demand or cut energy available for export, worsening balance of payments and energy supply security. (5) Subsidies encourage smuggling. 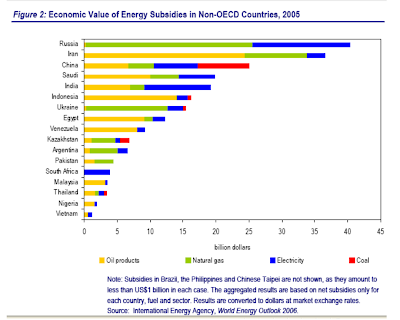 (6) Subsidies to Old Energy undermines the development of New Energy. 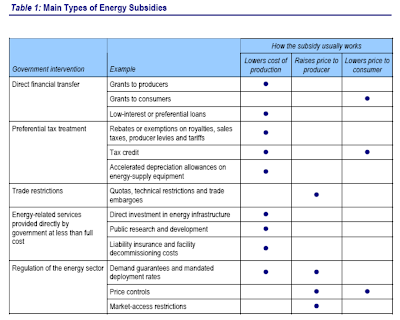 - Subsidies do not help the poor because (1) the poorest cannot afford even subsidised energy or may have no physical access to it, (2) the poorest do not use enough energy for a subsidy to matter much (while the rich use much and therefore benefit much), and (3) subsidies often lead to rationing and rationing benefits the more affluent and the black market. Measures to those whose losses are significant. (3) Should be justified clearly by leaders to counter political inertia and opposition. Pennsylvania, homestate of The Deer Hunter, is most proud and protective of its wildlife-oriented recreation. It required a unique agreement of wind developer Everpower before it would allow their Highland Wind Project to go forward. 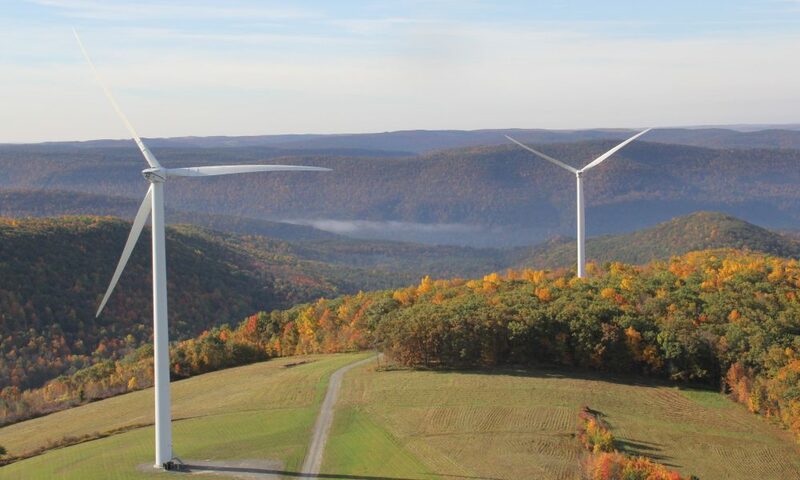 In a perfect example of how the wind energy industry is completely committed to bringing the nation clean New Energy on a massive scale in the right way, Everpower signed a voluntary agreement with the Pennsylvania Game Commission designed to avoid, minimize and, if necessary, mitigate adverse impacts on wildlife resources. The wind developer was required to prove its project would not harm plant and animal species. Everpower was also required to search the Pennsylvania Natural Diversity Index and resolve all rare species impact issues. 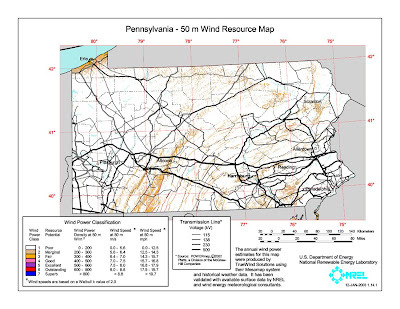 EverPower is a participant in Governor Rendell’s Pennsylvania Wind Farm and Wildlife Collaborative, organized to develop wind energy in an environmentally responsible manner. It fully accepted the agreements and fulfilled them wholeheartedly. As is usually the case where there is a flurry of development (see WILL PENNSYLVANIA BUILD ITS SOLAR POWER PLANT? ), PA has other policy that supports New Energy. Pennsylvania’s Alternative Energy Portfolio Standards Act requires the states’ utilities to obtain 18% of their power from New Energy sources by 2021. With this RES and other policy proposals now pending, Governor Ed Rendell hopes to generate 3,000 to 4,000 megawatts of wind capacity as well as create 13,000 new jobs, decrease dependence on foreign oil and save $1 billion a year in energy costs. A pioneer of Old Energy and proud of its heritage, Pennsylvania is now looking ahead to the 21st century and pioneering New Energy, installed and maintained with the dual goals of maximum power generation and minimal environmental harm. Everpower is opening a Pittsburgh office and building the Highland Wind Project while Converteam continues its Pittsburgh-based energy conversion activities. - Converteam has been aggressively expanding its Pittsburgh team of engineers over the last year, drawing on the supply leftover from Pittsburgh’s glory days as a steel, coal and oil center. - The Highland Project is being built on a reclaimed strip mine. It is expected to begin producing power in either late 2008 or early 2009. 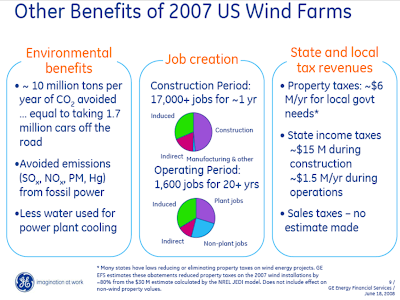 - The U.S. built more new wind capacity in 2007 than any other country in the world. - Everpower has offices in New York and Portland, Ore.
- The Highland Project is in Adams Township, Cambria County, in southwest PA.
- Converteam Conversion Camp is based in France. It North America HQ is Pittsburgh. 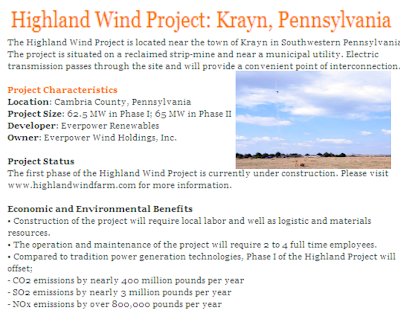 - The Highland Wind Project will cost $140 million to reclaim the land and install 25 turbines. Its 1st phase will have a 62.5 megawatt capacity and its 2nd phase will have a 65 megawatt capacity. - Converteam hired 100 engineers in the past 12 months. It currently employs 280. - Gamesa, Iberdrola and Conergy are also developing plans in PA.
- PA has 293 megawatts of installed wind energy capacity. 298 megawatts more (including the Highland Project) will come online in 2008. 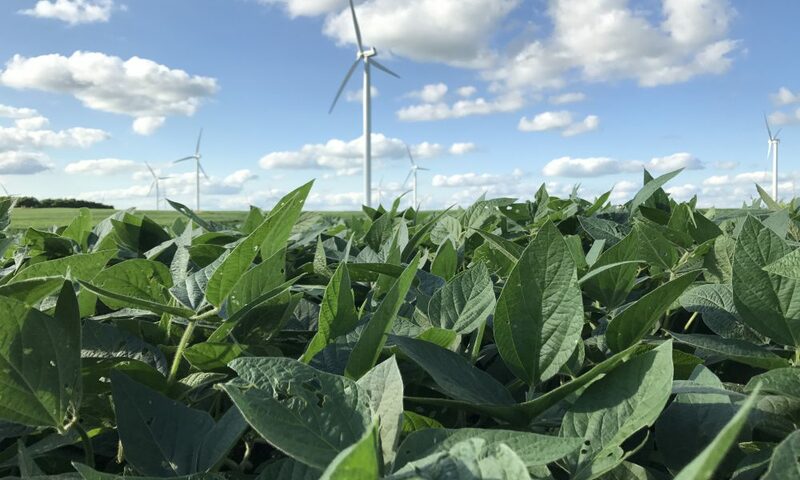 -Because most wind intallations are built in remote areas where winds are strong, the wind industry is expected to create $1.2 billion in new income for ranchers, farmers and rural landowners. - Bob Misback, worker, Converteam Conversion Camp: "Wind energy is only about 1 percent of electricity supplied in the United States. The government wants to push that to 20 percent sometime in the future…Pittsburgh has a good population of very educated people, including engineers. We have a lot of universities here. The steel industry used to be a very technical business…"
Wind energy was second only to natural gas in providing new electricity in the U.S. in 2007. Just because wind is an emissions-free source of electricity does not mean it is any less substantial than the traditional, greenhouse gas-emitting sources. It is as legitimate and reliable and essential a source of power for the U.S. grid as any fossil fuel. And wind energy has achieved what the solar industry calls grid parity, which means wind energy-generated electricity is now cost-competitive with fossil fuel sources. Vestas Wind Systems A/S, the world’s biggest wind turbine manufacturer, and many others in the wind energy industry believe that when more citizens understand how substantial and mainstream wind power is, they will not tolerate leaders who refuse to offer it at least the same policy support provided to Old Energies. Ditlev Engel, CEO, Vestas: "We want to show people: Here's technology you have but don't use…All Danes know what a wind turbine is…But in the U.S., wind is just 1% of the total and the turbines are in select areas." In Denmark, wind energy provides 20% of the electricity. Vestas is going to invest $100 million over the next 2 years in educating U.S. citizens about wind energy on the assumption that when Americans find out more about wind energy, they will want more. This is exactly the same impulse behind The Pickens Plan, energy entrepreneur T. Boone Pickens’ $58 million dollar campaign to convince the U.S. of the validity of his plan to move the U.S. away from imported oil and toward wind energy. 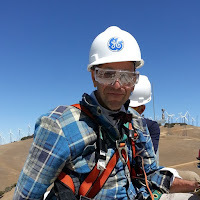 Tired of waiting for a minority of obstructionists in the U.S. Senate to come around, Pickens, Vestas and others who are invested in and believe in wind are taking their case to the people. They seem determined to demonstrate on behalf of New Energy that when the people lead, leaders follow. Seth Farbman, managing director/ Greenery group head, Ogilvy & Mather: "Consumers aren't going to run out and buy wind turbines, but they do influence government and politicians…If politicians feel that constituents support alternative energies like this, they're more likely to support legislation that allows these technologies to grow more quickly…"
The “get ‘em when they’re young” angle: Besides the print, online, radio and TV spots, Vestas has placed displays and play stations of LEGO toy turbines in U.S. airports like LAX and JFK in NYC. 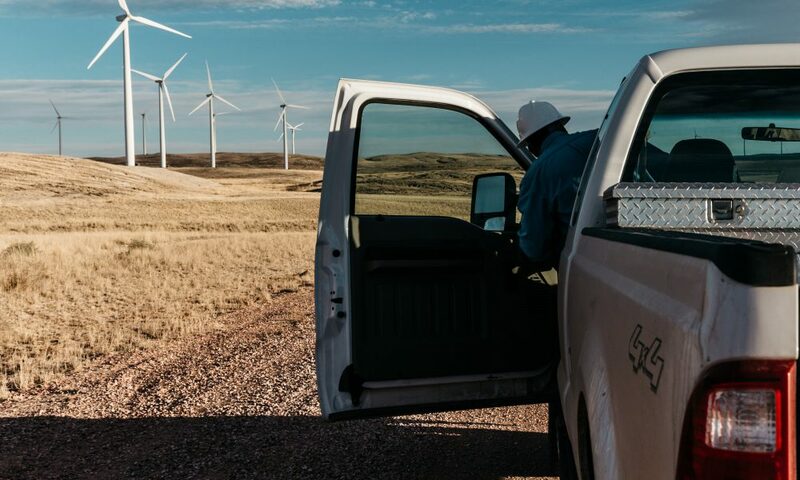 There is something in it for the American people, too: The ad campaign also seeks to send U.S. workers to Vestas and other companies in the wind energy industry where they will find a windfall of job and career opportunities. The first of the Vestas ads. From Vestas via YouTube. Vestas Launches $100 Million Consumer Ad Campaign In U.S.
Vestas, No. 1 in Modern Energy is a $100 million advertising campaign from Vestas aimed at educating the U.S. public about the potential of wind energy. The Pickens Plan. From campaigntvads via YouTube. - The Vestas $100 million public relations campaign will extend over 2 years. - This is Vestas’ first ad campaign aimed at consumers. - Vestas is based in Randers, Denmark. - In Denmark, wind provides 20% of the electricity. 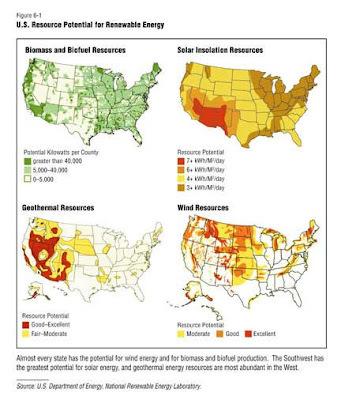 - In the U.S., wind provides 1% to 2% of the electricity. - In Europe, LEGO has a popular Vestas turbine-making toy. - Vestas is the biggest turbine manufacturer in the world and sells 23% of all wind turbines. - Many Americans understand New Energy to mean solar energy but wind energy is more cost-competitive and has more built capacity. - The ad campaign comes a Vestas push expanding its presence in the U.S. It has recently built new manufacturing capacity in Colorado and employs 1,220 people in the U.S. (which will grow to 4,000 by the end of 2010). - Vestas has 18,000 employees and 2/3 are non-Danes. ~70% of company shares are foreign-owned. 99.8% of revenue comes from outside Denmark. - The new ad campaigns from Vestas and Pickens emphasize wind’s potential as a solution for dependence on imported fossil fuels and as a solution for global climate change. - AWEA preceded the big media splashes with a radio campaign last year. - The model for these big P.R. campaigns is the success of Al Gore’s An Inconvenient Truth. - GE and DuPont have run similar campaigns, aimed at consumers and at affecting public opinion. GE wind power ad. From GE via YouTube. - Julia Bovey, media director, Natural Resources Defense Council: "Being in the hearts and minds of the public can make a big difference if you're in a political fight…"
- Ditlev Engel, CEO, Vestas: "We want people to take wind into the equation…"
- Seth Farbman, managing director/ Greenery group head, Ogilvy & Mather: "We all understand there's a need for renewable energy, and wind is one of them. But we don't know yet which companies will fulfill that need…It's still early enough in the game where a company can gain some of that leadership, in the sense of influence over regulation and better visibility when they're selling in this space." - Ditlev Engel, CEO, Vestas: "We want to create a borderless organization…"
The news in the solar energy industry is not about war, not about political infighting, not about heartbreaking economic ruin. It’s just about business growing steadily larger, about an industry edging toward grid-parity and the capacity to solve the single most daunting challenge to the world community, global climate change. Note the increase in silicon-manufacturing infrastructure. This means more silicon availability. The long-sought economies of scale expected to drive costs down are drawing ever closer to becoming a reality. Note how busy Asian companies expect to be, making and selling silicon solar products. Many European companies, now dominating EU markets, expect severe competition from Asian companies for subsidy-supported European sales. 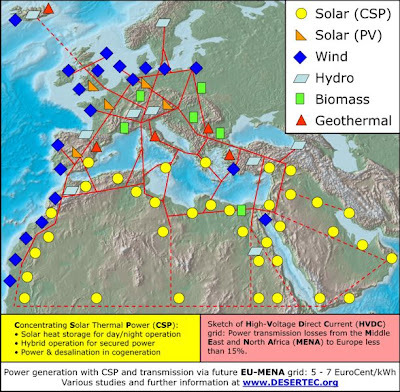 Note the selection of the unlikely, unsunny location of Renewable Energy Corporation (REC)'s new polysilicon processing plant: The 17-month, 16-country search ended with the selection of Quebec because the energy-intensive manufacture of silicon wafers and cells can be done there using emissions-free hydro-electric power. Hydro-Québec seduced REC with a 20-year offer of the preferential power rate it gives 200 favored Quebecois industrial customers. Even for New Energy companies, New Energy at good rates is the crucial factor in doing business. By the time their agreement runs its course, the cost of emissions-generating power will be prohibitive. But in 20 years REC and Hydro-Québec will surely be renegotiating with the options of wind or solar on the table. Last note: In announcing the REC deal, Quebec Premier Jean Charest also mentioned the province’s development of wind power and a $1.9-billion upgrade of Hydro-Québec’s nearby Gentilly 2 nuclear-generating plant. Premier Charest: "Energy is part of our DNA…"
That’s just about the right mix of genes, Mr. Premier. It is also just about what will be economic for the next 20 years or so: Aggressive efficiency. New hydro, solar, wind and biomass generating capacity. Natural gas development and upgrades to nuclear as bridges to a 21st-century energy infrastructure. Experiments with “clean” coal but no new coal-burning plants. A transition to grid-powered (and pedal-powered) personal transportation. - Trina will almost double its buy of polysilicon from GCL. - AmTech/Tempress got a $7.5 million order for more silicon wafer/solar cell processing systems. - REC will build a $1.2 billion polysilicon manufacturing plant in Quebec. - The Trina purchase will cover 8 years of PV module production. - REC has conducted a 17-month search for a new plant site. Pre-engineering at the selected Quebec site will begin in 2009, with construction in 2010 and production in 2012. - The order for more AmTech/Tempress silicon wafer/solar cell equipment came from an undesignated Asia-Pcific customer. - REC will build a polysilicon manufacturing plant in Bécancour, Quebec, Canada, across the river from Trois Rivières. - REC is based in Norway, has silicon plants in Moses Lake, Wash., and Butte, Mont., and has 14 different expansion projects under way in Sweden, Norway, North America and Singapore. 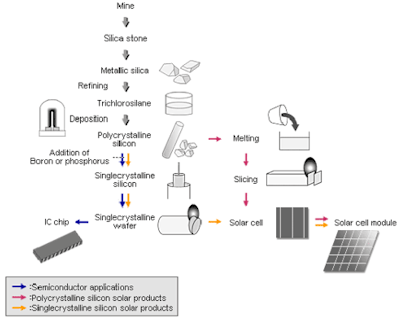 - Polysilicon is the raw material used in the production of some kinds of photovoltaic solar wafers and cells. - Trina will purchase enough silicon from GCL to produce 4,825 megawatts of PV solarup from a previously announced purchase of enough silicon for 2,600 megawatts of PV. 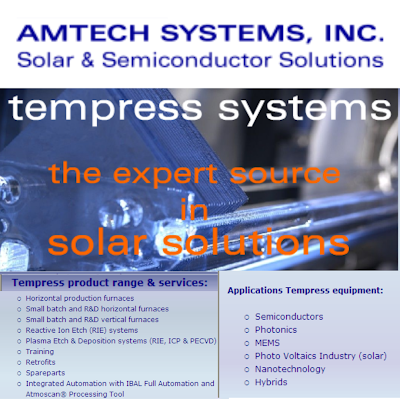 - Tempress makes production/automation systems and supplies for the manufacture of solar cells and silicon wafers. 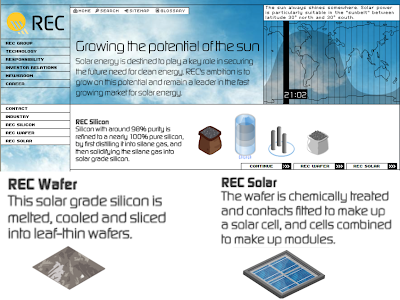 - REC is one of the world's largest makers of solar-grade silicon. It had revenues of $750 million in Q1 and Q2 of 2008. - The $1.2 billion REC plant will be one of the biggest private-sector investments in Quebec in 10 years. The site REC leased will accommodate 4 plants like the one planned and discussions about expansion are ongoing. - Full operation at the REC plant: 300 full-time jobs, $100 million/year economic benefits to Quebec. - J.S. Whang, President/CEO, Amtech: "We are very pleased to receive this sizeable follow-on solar order in the rapidly growing Asia-Pacific region, which further demonstrates the increasing acceptance we are seeing for our solar products from our worldwide base of solar customers. We continue to be optimistic about the strength of our marketing pipeline and opportunities to grow our solar business into fiscal 2009." - Erik Thorsen, President, REC: "It has been a long journey to where we stand today…We look forward to a long and industrious relationship between REC and the people of Quebec." - Jean Charest, Premier, Quebec: "It's part of a broader vision of how we see the future of Quebec, and energy as a part of it…I want it to be a star project that'll generate interest for investors elsewhere in the world." In April, 2007, the Supreme Court changed the course of the fight against global climate change by ruling that greenhouse gases (GhGs) must be considered a pollutant, under the terms of the Clean Air Act, and, therefore, require scrutiny by the Environmental Protection Agency (EPA) for their role in climate change. The decision came in response to a lawsuit brought by 12 states and 13 environmental groups and argued by the Massachusetts Attorney General. The EPA has, since that Supreme Court decision, abdictated its judicially assigned responsibility. The Senate committee on environment and public works, chaired by Senator Barbara Boxer (D-Calif), heard explicit testimony from members of the EPA staff describing suppression by the White House of efforts by EPA regulators to submit recommendations for GhG reductions. In the absence of any federal action against climate change – despite the landmark Supreme Court decision – a lawsuit against the EPA has been the only weapon left to those who believe GhG regulation is urgently needed. Most observers anticipate federal action on global climate change to come in the first 100 days of the next administration, whichever party prevails in the November election. Should fresh leadership fail to produce such vitally needed action, expect an unending stream of lawsuits like the one brought by New York, 11 states, D.C. and the City of New York against the EPA for failing to take action against oil refinery emissions. 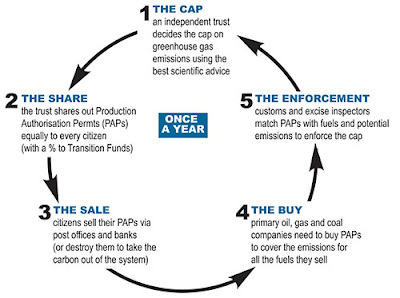 The Environmental Protection Agency (EPA); The states of New York (Andrew Cuomo, Attorney General), California, Connecticut, Delaware, Massachusetts, Maine, New Hampshire, New Mexico, Oregon, Rhode Island, Vermont, Washington, the District of Columbia, the City of New York. A suit is being brought by Attorney General Cuomo on behalf of New York, 11 states, D.C. and New York City against the EPA for failing to regulate greenhouse gas emissions from oil refineries. The suit was filed August 25. This lawsuit was filed in the U.S. Court of Appeals for the D.C. Circuit. - The EPA’s argument for not regulating GhGs was that Congress should do so. - Lawsuits have also been brought by coalitions of states against the EPA on vehicle emissions and power plant emissions. 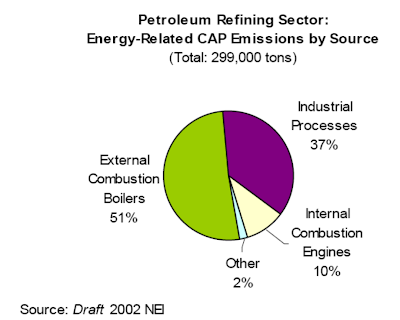 - According to this suit, 15% of U.S. industrial GhGs come from oil refineries as they burn oil to refine petroleum into high-octane auto and jet fuels. - The suit would force the EPA to regulate and control oil refinery emissions. NY Attorney General Cuomo: "The EPA's refusal to control pollution from oil refineries is the latest example of the Bush Administration's do-nothing policy on global warming…Oil refineries contribute substantially to global warming, posing grave threats to New York's environment, health, and economy." There is a way to make money in Wall Street markets as stocks fall in value. It is called selling short. It may soon be time to sell New Energy stocks short. But not right away. Just as Senator Clinton proved it is a little early to label the Democrats' familiar family squabbling as truly disabling disunity, New Energy is off on a good run, at least in the short term. 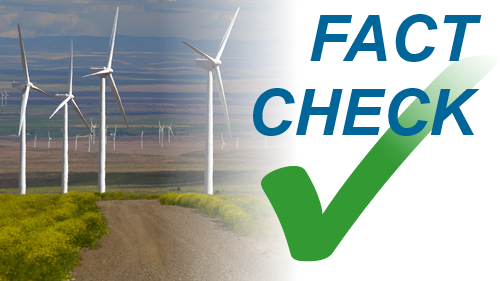 For the next few months, solar and wind energy stocks’ values will rise as companies rush to complete any and every project they possibly can before wind’s vital production tax credits (PTCs) and solar’s investment tax credits (ITCs) expire on the last day of 2008. 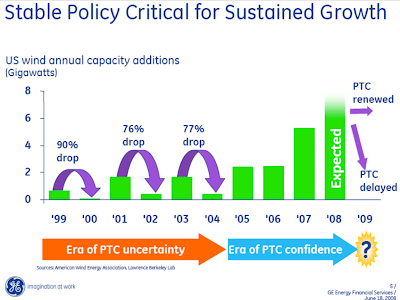 Congress can look back on 3 previous years when it allowed the wind industry’s PTCs to expire and see a crash is inevitable if it continues to reject extension of the credits. This time the crash will affect the solar industry as well. Solar and wind trade associations predict early 2009 layoffs could affect 115,000 workers and projects worth more than $20 billion. One Washington watcher counted 13 separate votes this year on which one or the other or both houses of Congress rejected bills extending the credits. Congress may find a way through the partisan gridlock preventing extension but it appears the parties will keep energy as an issue for the November election when they adjourn in mid-October. Republicans like telling their constituents the Democrats’ refusal to allow more oil drilling is what is keeping gas pump prices high. Democrats like telling their constituents the Republicans refusal to back New Energy is yesterday’s thinking. As wind and solar companies rush to get their projects completed and qualified for the expiring tax credits, their unnatural hyperactivity is wreaking havoc on market dynamics. Result: A boom, to be followed by an inevitable crash early in 2009. Larry Sherwood, consultant, Interstate Renewable Energy Council: "This is a classic boom-bust cycle, and it's not at all good for the industry…"
That’s not all it’s not good for, Larry. New Energy is one of the few economic sectors so far unharmed by the financial troubles resulting from the subprime mortgage scandal and subsequent real estate mess. Congress, for political purposes, appears set to withhold the tax credits’ extension and send the sector into a crash. It could have economy-wide reverberations. A solar energy company CEO recently confided to NewEnergyNews that 2009 is shaping up to be a “lost” year. Even if the next Congress restores the tax credits, it will take months to get things straightened out and rolling again. Thus, it may be time - barring a miracle - to consider selling short. Requests for miracles and other opinions can be expressed directly to Senators and Congressional Representatives at Support Renewable Energy Tax Credits. Congressional gridlock has so far prevented extension of the New Energy federal tax credits. Insiders seem convinced legislation will not be taken up in the fall. There is a flurry of activity to finish projects before they expire at year’s end, when a crash is expected. - The federal tax credits expire Decmeber 31, 2008. - Congress will go back to work after the presidential nominating conventions and adjourn for the year in mid-October. - Plans for New Energy projects previously scheduled for 2009 are being postponed or cancelled. - Nevada: Sempra Generation is hurrying to finish a solar farm though it does not yet have a power purchase agreement with a utility. - Arizona: Abenogoa is unable to get financing for a planned $1 billion solar power plant. - The Midwest: National Wind has 4 wind projects on hold, pending the fate of the PTC. - 8,000 megawatts of wind energy capacity are under construction. - Solar panel installations are up 74%. - The cost of the federal tax credits is estimated at $1.7 billion/year. A GE Energy study shows conclusively that money spent to incentivize New Energy projects comes back to the federal budget as revenue. - When Congress allowed New Energy tax credits to expire at the end of 1999, 2001 and 2003, business fell off precipitously. Turbine installation once dropped 93%. - Curtailment of the PTCs and ITCs could affect 115,000 U.S. workers. - Tristan Grimbert, CEO, EnXco: "We will go the extra mile to be on time." - Michael Allman, CEO, Sempra Generation: "We stepped out a little bit…"
With the growing momentum of big New Energy installations, the hunt is on for the most economic means of storage. 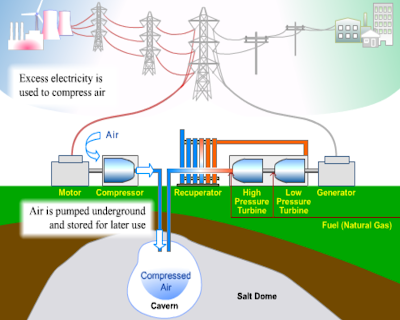 One of the first and best options: Compressed Air Energy Storage (CAES). The basic idea has been seducing engineers and dreamers since at least the 1970s: Intermittent sources of energy like wind and sun drive compressors to pressurize air in arrays of pipes and tanks or vast underground caves. The air is subsequently released in a steady, predictable stream to meet energy demands in exactly the same way any other power plant steadily, predictably generates energy. Example: Wind often is strongest at night, when demand is lowest. Some night winds could be used to run the grid while excesses could be stored and released to supplement other grid supplies during the working day’s peak demand. Yes, it will change the game and reduce fossil fuel dependence - when it is done efficiently and cost effectively. Previous attempts have proved the technology but not met cost and efficiency requirements. Important stipulation: Wind energy’s intermittency issues are readily skirted by the fact that it is predictable. Where the wind is expected to drop off, power providers can integrate grid supply from other locations where the wind is blowing (or from other power sources). 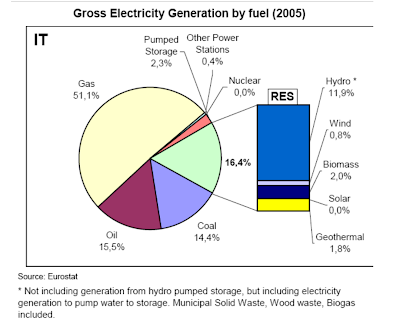 Currently, almost all the wind energy-generated electricity produced is fed into the gird and consumed. In fact, the U.S. Department of Energy study affirming the practicality of the wind industry's plan to provide 20% of U.S. electricity by 2030 indicated there is no need for storage to do so. New technology may make the CAES concept, tried in various configurations since the 1970s, more workable. Utilities are interested. 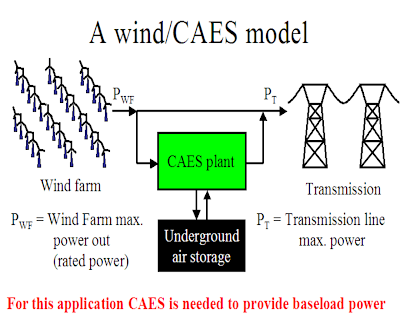 The most affordable use of CAES would be where large wind (or solar) installations are in the vicinity of existing unused mines, oil & gas wells, caverns or reservoirs. In such cases, dthe cost of building storage would not be as great. An underground reservoir the size of a pro football stadium could hold 900-megawatts of compressed air energy. It would take 8 hours to fill and could release power for 8 hours. There are 2 “best uses” of storage: (1) For wind, it reduces the need even further for baseload supplementation by fossil fuels or nuclear, and (2) for solar, it offers the ideal solution for night generation. It is unlikely there will be enough infrastructure built in the immediate future to urgently necessitate either. The 2020s, however, are not that far off. And remember what Laura always says. Nevermind who Laura is. Just remember what she says: Prior planning precludes poor performance. Energy Storage and Power, a joint venture of Nakamkin and PSEG Global, will develop and promote a Compressed Air Energy Storage (CAES) technology. - The CAES concept is decades old but has never been perfected at a competitive cost. - 1970s: A CAES plant was developed in Germany. - 1991: A CAES plant was developed in Alabama. - P.S.E.G. Energy Holdings will invest $20 million over three years in the new CAES project. - The joint venture will be based in New Jersey. - P.S.E.G. 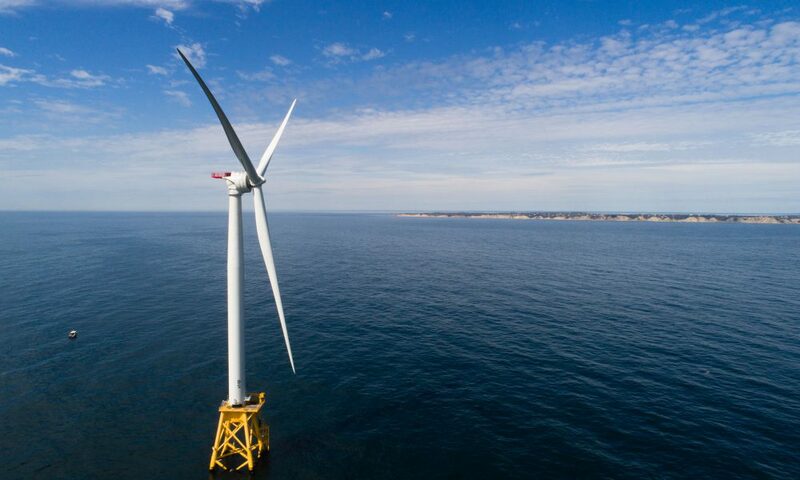 Global wants to build a wind installation off the New Jersey coast. - Compressed air storage could be in pipelines, tanks or underground caverns. - A reservoir is typically about 1500 feet underground. - A CAES storage option could be added to the planned P.S.E.G. Global offshore installation. - The offshore installation would have 95 turbines and a 350 megawatt capacity. - P.S.E.G. Global is sister company to Public Service Electric and Gas Company, New Jersey’s largest power distributor. - Nakhamkin worked on the plant in Alabama. - Improvements in this generation of CAES technology: (1) reduced generator startup time, cutting compressed air consumption and emissions; (2) more standard components, potentially cutting building costs. - New Jersey storage would likely be in tanks and pipelines because the state’s solid rock ground would make digging caverns expensive. - Upstate NY offers depleted salt carverns in the vicinity of wind installations. - With enough of a CAES infrastructure, New Energy-generated electricity could become a commodity sold across the grid nationally. Investor/securities authority William D. Glubiak says emissions offsets trading is a fulfillment of the potential of Nobel laureate economist Milton Friedman’s free market economics. Glubiak observes, in what he calls the “green movement,” a move toward social responsibility in individuals’ and corporations’ choice of investments. And he describes how the free market, by moving to fulfill that demand, can serve both wealth and the environment. The first step in social responsibility is something straight out of the Hippocratic Oath: “First, do no harm.” Be efficient. Generate no unnecessary emissions. How perfect: The planet is running a fever. Every citizen is a doctor charged, first and foremost, to do no further harm. An active life in a society designed around the generation of fuel by burning things, though, inevitably necessitates some harm. For that, there is the opportunity to invest in businesses that earn money using New Energy or using energy efficient methods. Such investments balance excess emissions by sponsoring reduced emission-activities. Businesses seeking to balance their excess emissions have the opportunity to sponsor businesses that generate New Energy. Buyers and sellers of such offsetting investments make a marketplace. 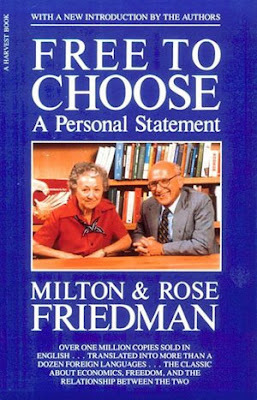 Nothing could make Milton Friedman happier, Glubniak suggests. He also points out, as evidence of the change the emissions trading marketplace has already created, that corporations are beginning to add the company’s carbon footprint and its socially responsible actions into annual reports. He is here describing the further emergence of what award-winning author and economist Hazel Henderson has called the sustainability sector. It is exciting to see a proponent of emissions offsets trading present an argument for socially responsible investing. Concern must remain about the so-far demonstrated inability of investors to recognize the difference between truly socially responsible investments (wind and solar energies) and those that merely promise it (corn ethanol, carbon capture and storage). Friedman advocated the most unfettered market activity. Emissions trading could be the free market’s way of controlling greenhouse gas emissions and the global climate change they induce. - Friedman died in 2006. He was one of the most influential economists of the 20th century. - The MOST influential? Well, Keynes has exerted influence for about twice as long. But then there is Keynes’ own remark, “In the long run, we’re all dead.” He and Friedman most certainly are. 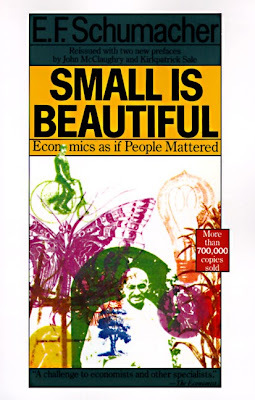 - If the most apocalyptic of the Peak Oilers turn out to be right, E.F. Schumacher, author of Small Is Beautiful, may someday to be seen as more influential than Keynes or Friedman. Chicago Climate Exchange (CCX) was formed in 2003. - CCX is emerging as the primary arena for trading voluntary emissions offsets. - Social responsibility drives investors toward carbon neutrality and toward investments that offset activities that generate emissions. - Basic premise: Humans pollute and so do corporations. - Carbon footprint: How much we pollute. A reduced carbon footprint equals less environmental harm. - Keys to carbon neutral practice: Green design, energy efficient technology. - Engineers have the key skill set to develop technology at which trading investments aim. A U.S. Army study done in the early 1990s, after the first Gulf War, came to an unsurprising conclusion: Saudi Arabia is the Saudi Arabia of solar energy. The Saudis are the buckle on the Eastern Hemisphere’s sun belt, a region – said to have the best solar resources on earth – that runs from the western edge of North Africa to the eastern edge of Central Asia. The idea of harvesting Middle Eastern sun and delivering it to Europe via a trans-Mediterranean cable, based on German research studies, had been slowly, quietly gaining popularity since it was first presented in 2003. This summer it was endorsed by the leaders of France and the UK and was a major focus at the July 2008 first meeting of a new organization, Union for the Mediterranean. But the idea still seemed a little grandiose and ambitious to most. Then Georgia invaded South Ossetia and Russia invaded Georgia and suddenly everybody who had been advocating the idea went from dreamer to visionary. Building a cable across the Mediterranean suddenly seemed not only practical but a lot more practical than building pipelines that make Europe more dependent on Russian-controlled natural gas. One scientist estimates it would take only 0.4% of the solar energy that falls on the sun belt to provide all of Europe’s electricity. That leaves a lot of room for the vagaries of intermittency. Guess who else likes the idea. Ali al-Nuaimi, Oil Minister, Saudi Arabia: " One of the research efforts that we are going to undertake is to see how we make Saudi Arabia a center for solar energy research...over the next 30 to 50 years..."
Minister al-Nuaimi is in for a surprise if he really thinks this is going to wait that long. But there is every reason to believe al-Nuaimi is being a little coy. He understands the economics of energy pretty well. Minister al-Nuaimi: "In the same way we are an oil exporter…we can also be an exporter of power." TREC is leading the effort to incentivize the development of solar power plants and other New Energy sources throughout the Eastern Hemisphere’s “sunbelt” and the development of a “supergrid” connecting the Middle East and North Africa to Europe. - 2007: Prince El Hassan of Jordan called for an Aollo-like project to implement TREC’s plan. - July 2008: French President Nicolas Sarkozy and UK Prime Minister Gordon Brown publicly endorsed the supergrid concept. - August 2008: Georgia invaded South Ossetia and Russia invaded Georgia. - 2010: An Algerian combined cycle natural gas/solar power plant will be generating 150 megawatts of electricity. - 2025 TREC goal: 6,000 megawatts of solar-generated power flowing to Europe. - The Eastern Hemisphere’s “sun belt” runs from the western edge of North Africa to the eastern edge of Central Asia. and is said to have the best solar energy resources on Earth. - Hassi R'mel, Algeria, 260 miles south of Algiers: Construction has begun on a combination of solar and natural gas power plant. - The Eastern Hemisphere’s “sun belt” is said to have the best solar energy resources on Earth. - The desert nations of the sun belt also see the development of New Energy as a source of power with which to desalinate sea water, a very important consideration in light of looming worldwide drought. - Little has been done beyond planning with the concepts of sun belt solar power plants and the supergrid but Russia’s further exertion of its control over natural gas supplies to Europe makes development much more likely. - The combined cycle Algerian plant will have a 25-megawatt solar capacity. - Ali al-Nuaimi, Oil Minister, Saudi Arabia: "For a country like Saudi Arabia ... one of the most important sources of energy to look at and to develop is solar energy… "
- Tewfik Hasni, managing director, New Energy Algeria (NEAL): "Our potential in thermal solar power is four times the world's energy consumption, so you can have all the ambitions you want with that…"
Utah is not like the left coast. Utah is not about fads and the outlandish. Utah is about church and the land. Utah is not about handouts to the undeserving, it’s about hard work and a helping hand for those willing to do it. That’s why it’s so remarkable to read a Utah newspaper editorial calling for “substantial” New Energy incentives. 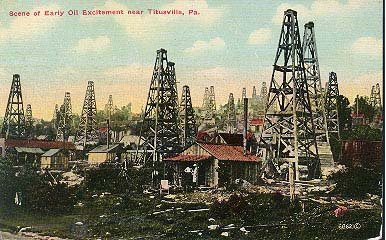 The federal government subsidized the U.S. oil and gas industry’s rise to world dominance in the 20th century with substantial tax breaks, protective tariffs and supportive regulations. It was by no means an exceptional policy. The British once protected and subsidized coal and the French now do so for their nuclear industry. Energy is simply too vital to a nation’s economy to leave it to the vagaries of the marketplace. The debate is now fully joined in the U.S. Congress: There between those, like Senator Harry Reid of Nevada and Massachusetts Congressman Ed Markey, who want to see money shifted away from incentives for oil and gas to incentives for New Energy. And there are those, like Utah Senator Orrin Hatch and Utah Congressman Rob Bishop, who – mired in a way of thinking that was born in the 1950s and died in the 1970s – believe that if it isn’t fossil fuels, it isn’t energy. The broad outlines of the necessary subsidies will come as no surprise to regular NewEnergyNews readers. They are the New Energy incentives so frequently called for here: (1) Extension of the vital federal tax credits, (2) a national Renewable Electricity Standard (RES), (3) tax breaks for the purchase of Plug-in Hybrid Electric Vehicles (PHEVs) and energy efficient appliances and (4) R & D funding for New Energy. The legislation granting the incentives so necessary to build the energy infrastructure of the 21st century may not come this year – but there is no need to despair. In the immortal words of Sam Cooke, "A change is gonna come." Leaders from across the country and across party lines, including Republican Governor Jon Huntsman of Utah and Democratic Senator Harry Reid of Nevada, called for strong New Energy incentives at the National Clean Energy Summit. - The Summit was August 18 & 19. - The Summit made it clear that, as the Salt Lake Tribune’s editorial acknowledged, New Energy is the energy of the future. The National Clean Energy Summit was in Las Vegas. - The production tax credits (PTCs) and investment tax credits (ITCs), on which New Energy and Energy Efficiency innovation depends, have by one count been rejected in one form or another 13 times in 2008. 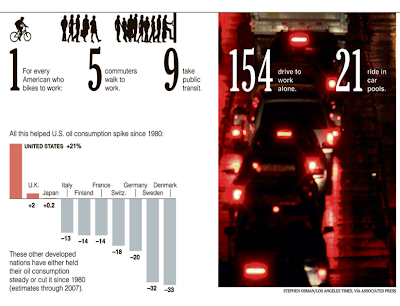 - The state of Utah went to a 4-day workweek at the beginning of August. - Huntsman said at the Summit that the technology is available to move the nation away from dependence on oil and from global climate change-inducing greenhouse-gas emissions. - A speaker at the Summit from Google said New Energy will get less expensive. Wind energy-generated electricity is cost-competitive and it is the goal of the Google Foundation to make solar energy-generated electricity cheaper than coal power palnt-generated electricity. - The incentives called for at the Summit included (1) multiyear federal tax incentives for New Energy investment and production, (2) a national Renewable Electricity Standard (RES) requiring that all utilities obtain 20% of their power from New Energy sources by 2020, (3) tax breaks to incentivize the purchase of energy efficient vehicles and appliances and (4) funding New Energy technology development. 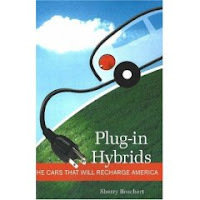 Plug-in Hybrids: The Cars that will ReCharge America by Sherry Boschert: "Smart companies plan ahead and try to be the first to adopt new technology that will give them a competitive advantage. That’s what Toyota and Honda did with hybrids, and now they’re sitting pretty. Whichever company is first to bring a good plug-in hybrid to market will not only change their fortune but change the world." 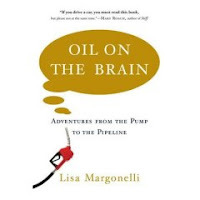 Oil On The Brain; Adventures from the Pump to the Pipeline by Lisa Margonelli: "Spills are one of the costs of oil consumption that don’t appear at the pump. [Oil consultant Dagmar Schmidt Erkin]’s data shows that 120 million gallons of oil were spilled in inland waters between 1985 and 2003. From that she calculates that between 1980 and 2003, pipelines spilled 27 gallons of oil for every billion “ton miles” of oil they transported, while barges and tankers spilled around 15 gallons and trucks spilled 37 gallons. (A ton of oil is 294 gallons. If you ship a ton of oil for one mile you have one ton mile.) 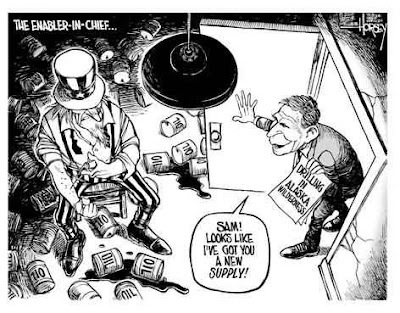 Right now the United States ships about 900 billion ton miles of oil and oil products per year." Friend of NewEnergyNews, friend of Wind Energy, friend of good eats in DC: culture me, d.c.
NOTEWORTHY IN THE MEDIA: NewEnergyNews would welcome any media-saavy volunteer who would like to re-develop this section of the page. Announcements and reviews of film, television, radio and music related to energy and environmental issues are welcome.